I added a new recipe to my main website that was posted on Low Carb Friends by DelhiBelli. Click HERE to see the recipe. Just a quick note to mention that my Aldi store has marked down their almond flour from $7.99 to $4.99. I splurged on two bags today. It was nice to pay the Trader Joe's price for almond flour and get blanched instead of unblanched. Maybe other Aldi stores have marked theirs down as well. Jimmy Moore sent me a copy of the new low carb cookbook that he co-authored with Maria Emmerich. 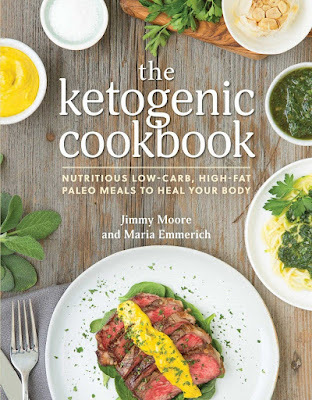 It's called "The Ketogenic Cookbook" and it's a beautiful book with full-color photos of every recipe. You can buy the book on Amazon, HERE. One recipe jumped out at me the first time I looked through the book and that was the Stromboli on page 198. It doesn't call for too many unusual ingredients and I just happened to have everything on hand to make it. I haven't bought coconut flour in years but I still have a small container of it in my freezer. I also have a container of ground pork rinds in the freezer from when I was eating them regularly. I used to save the bits at the bottom of the bag and grind them up to use for breading fish, etc. Anyway, other than those two somewhat unusual items, the recipe only calls for mozzarella cheese, butter, egg, seasonings and salami. I had a package of giant pepperoni in the freezer so I used that instead of the salami. I wasn't sure what to expect when I started making this. The photo in the book looked very bread-like but my "dough" mixture looked like a pile of gooey cheese. Fear not! 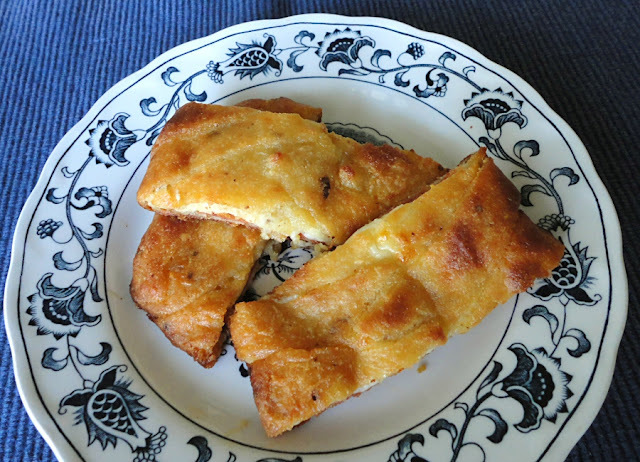 Once it has baked, the cheese "crust" gets all crunchy and browned and delicious. Jerry also gave it a thumbs up and I will make this again. We ate ours while it was still pretty hot but I found that the crust actually gets crunchier after it cools a bit. 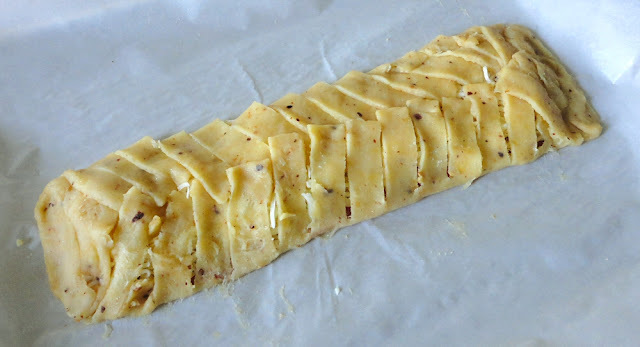 I cut the stromboli into about nine pieces. We ate this for dinner and we each had two slices and it was very filling. We'll find out tomorrow how well it reheats. UPDATE: This reheats quite well in a toaster oven. It's greasy so I suggest setting it on a baking sheet or a piece of foil. Watch it closely because it gets dark very quickly. UPDATE: I just discovered that the recipe is posted on the All Day I Dream About Food blog HERE. UPDATE: The original Up Late Anyway recipe is back online again HERE. She has step-by-step photos showing how to make it. Bear in mind that the recipe is slightly different than the one that I made from the cookbook. Instead of almond flour, the one I make has ground pork rinds. I haven't tried any other version yet because I like the results that I get with the pork rind version. 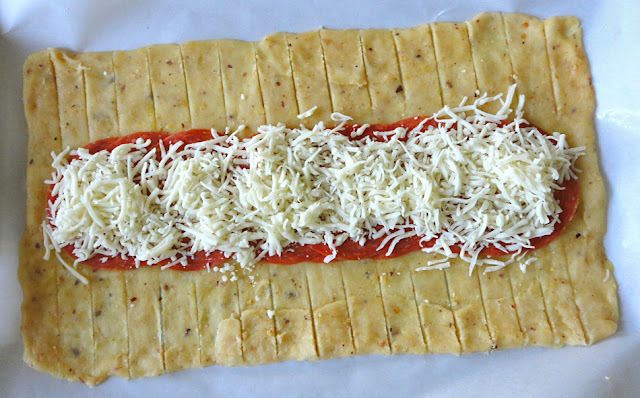 Also, on the blog she mentions that you need to use 2% mozzarella cheese. I just use the pre-shredded regular "part skim" kind and haven't had a problem. Rather than measure the length of my strips of dough, I placed the pepperoni slices down the center first and used them as a guide.